The latest presentations of Der Ring des Nibelungen at New York’s Metropolitan Opera reprise Robert Lepage’s production, last seen in 2013. His primary theatrical innovation, a $90M 45-ton stage machine, consists of movable aluminum panels which both change the topography of the scenes and allow for Pedro Pires’s spectacular projections. 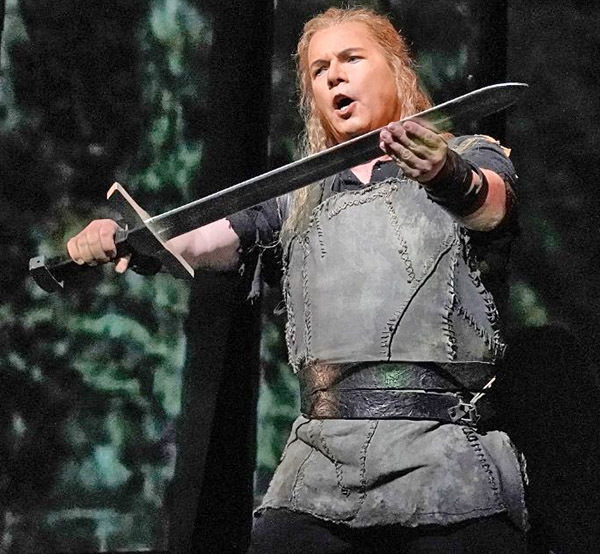 On April 13th, the season premiere of the third opera of the cycle, Siegfried, garnered a deservedly rapturous reception from the capacity audience at Lincoln Center. Siegfried has been called the “scherzo of the Ring,” and in this instance we heard much laughter during the superb performance. The enormous bear that Siegfried brings home to taunt his evil foster-father Mime, along with the inevitable “Das ist kein Mann!” (That is no man!) when Siegfried sees the human female form for the first time after discovering the sleeping Brünnhilde and removing her armor breastplate, these elicited roars from the house. But there was also pathos in abundance, and for once the scene in which Siegfried slays the dragon Fafner wasn’t unintentionally comical. As the curse leitmotif blared from the brass, one immediately understood that Siegfried had won this battle, but not the war: his spoils of victory include the accursed ring that is at the center of the epic four-opera cycle. His innocent possession of the ring will ultimately bring him to his tragic end in Götterdämmerung. But that is many hours away, in the final act of the entire saga. The Lepage production has been roundly criticized for many things: its exorbitant expense; the creaking and croaking of The Machine (in this instance, largely quiet), the hollowness of the “concept”, and the lack of an overarching dramatic vision. However, having attended the full cycle in Bayreuth in 2014 directed by the German enfant terrible Frank Castorf, which featured a totally indefensible mish-mash of Euro-trash ‘updating’ (Rhinemaidens in a plastic swimming pool, a motel and diner in Texas, copulating crocodiles, and a Wall Street sendup that vaguely seemed an indictment of the capitalistic USA- pre-Trump, even), the Met production came as a relief. Lepage and Met general manager Peter Gelb have said they intended to stage the drama the way Wagner would have, if he’d had 21st century technology at his disposal. Seeing this Siegfried with the composer’s stage directions and scenic instructions largely respected and intact, with superb acting on the part of all the principals, deeply affected this writer. Some of the video projections proved especially effective, such as the beautiful forest bird, Wotan’s ravens, and the magic fire. Since 1951 when the “new Bayreuth” era began post WWII, staging Wagner has often been an exercise in ‘modernizing’ the staging and messaging. Some have worked more successfully than others (e.g. Patrice Chereau’s Ring of 1976, Wieland Wagner’s Parsifal productions of 1951 and 1962, and his Tristan of 1965). But some productions have made a mockery of Wagner’s exhortation “Kinder! Macht Neues!” (“Kids, make things new!”) I seriously doubt the composer would relish seeing his dramas, purposely set in mythical times and with archetypal characters worthy of Jung, played out in ways that are unrecognizable. Bayreuth today prides itself on being a “workshop” where new and innovative stagings can bring renewed relevance to the canonic ten operas that Wagner sanctioned for performance in the theater he built for his works. Perhaps the most revolutionary concept of all would be for Bayreuth to stage the works as he wrote them, which is what this Met production (and its predecessor, by Otto Schenk) attempts to do. On now to Saturday’s performance: The 44-year old Swiss conductor Philippe Jordan led masterfully. His pacing, balance within the orchestra and with the singers, and his thorough immersion in the Wagner sound-world took my breath away. Having experienced his Meistersinger at Bayreuth last summer, I was prepared for greatness, but this surpassed all expectations. It’s not surprising he’s been designated music director at the Vienna State Opera in 2020; the fickle and prickly Vienna audience and press should treasure their new hire. Christine Goerke as Brünnhilde wielded a splendid dramatic soprano with great range and power. For a house the size of the Met, she is made to order. And, she can act. Speaking of acting, both Nibelung brothers, Mime (Gerhard Siegel) and Alberich (Tomasz Konieczny) successfully avoided caricature, and both truly sang their roles rather than barked them. Konieczny has garnered special critical acclaim as Alberich, and deservedly so. Michael Volle, who was also a masterful Hans Sachs in Meistersinger at Bayreuth in 2018, portrayed the Wanderer, Wotan in disguise, with handsome tones. Erda was sung by the superb Karen Cargill, and the Forest Bird by the offstage, youthful Erin Morley. The famous horn solo that highlights the second act began with a couple of bloopers, but quickly gained footing. A friend and colleague of mine once said that Verdi and Puccini send you off into the night humming great tunes, while Wagner can sometimes cause suicidal thoughts. I can report that, in the long line to the restrooms at intermission, many were whistling or singing the aforementioned horn solo, or the Siegfried motif. Happy times at the Met and in Wagner-land. David Deveau, a concert pianist and music faculty member at MIT, is a life-long Wagnerite. Thank you, DD, for this wonderful review. I wish I was there. I was there in person on Saturday and it was mostly great. The only terrible thing was the audience itself. They laughed throughout the entire second act, and started loudly clapping 20 seconds before the end of the act. Painful!